Updates: A procedural vote allowing the bill to go to general vote passed easily. Almost there…Original post:It’s begun folks! Congress is in chamber debating healthcare reform. Passage odds on InTrade are over 95%. On MSNBC, Pat Buchanan called it a done deal. The GOP’s opening pitcher is boy wonder congressman Paul Ryan, who is talking about the nonsensical CBO score and the deficit. There will be several procedural votes today. A final vote may come sometime around midnight. If you’re not near a TV, you can watch the debate on C-SPAN here. Update: According to The Hill, the Democrats are definitely still short! As today’s historic healthcare vote is near, I ask that you do not let up and continue pushing. Anything you can do in these final hours to promote and publicly call for support is much appreciated and timely. Do not let up – do not quit. Keep everyone in positive thoughts – educate your members – make your voices heard. We are on the verge of history – but it is just the verge – it has not happened yet. 3:28: Stupak to hold press conference at 4:00 PM announcing his vote. The presumption is that it’s a “YES” but there’s nothing official on that. 3:31: For what it’s worth, here’s how we’d characterise the debate right now. The Republicans have been trying to hammer The Democrats on various points: earmarks, rules, the deficit, etc. Democrats are ignoring the claims, and sticking to rhetoric, not engaging the critics. 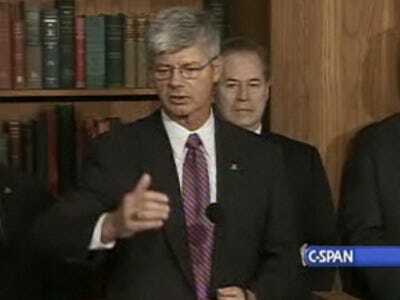 3:45: Evidently Stupak will announce that he’s a “YES.” POLITICO explains what’s about to go down. 4:00: The Stupak press conference is set to begin any second now. 4:05: Stupak is out on the podium. Marc Ambinder has a text of The President’s executive order which will limit abortion funding. 4:11: If you think there’s still a chance this could fail, you can make 33x your money over at InTrade, where the odds have hit 97%. 6:17: A final-final vote isn’t expected until late tonight, but nothing that’s happened this evening suggests the vote will be suspenseful.